Drink it raw. What's special about this tea? This chilli chai is a twist on our traditional chai, a recipe which has been the Indian drink of choice for many years. 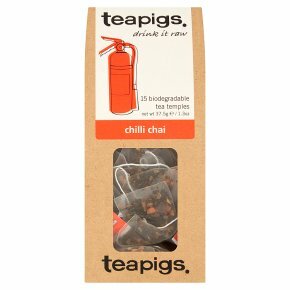 Alongside the assam tea, cardamon pods, chunks of ginger, cinnamon and vanilla we have added flakes of chilli. This chai is for those of you who don't order korma and plain naan from your local curry house. Louise Our tea temples: We use quality whole leaf only, not the dust found in regular tea bags; whole leaf is best. A tea worthy of worship belongs in our biodegradable "tea temple" - our spacious, transparent mesh bag allowing maximum room for perfect infusion. How we like it: Tea: 1 per person Water: 100°C Brew: 3-5 minutes Why not try as a Latte? Cover one tea temple with boiling water. Brew for 3-5 minutes. Top-up with hot, frothy milk. Yum, yum.